Regular readers of this blog will note that more often than not we take Getty to task for their actions, and how detrimental they can be to the business of photography. Yet, when Getty gets it right, credit must be paid where credit is due. Enter the players: Getty, Ron Vesely, MLB Photos, and Sports Illustrated, all focused on one thing - Mark Buehrle. The date? July 23rd, 2009. Buehrle sets the stage, pitching a perfect game for the Chicago White Sox, beating the Tampa Bay Rays, 5-0. Since I am not a sports enthusiast, let's move on to the matter at hand - the business of the photographs that captured that historic event. Ron Vesely, an immensely talented photographer who understands quite clearly that being a photographer means being in business, is no patsy to all the "we have to own all rights exclusively..." rights grabs made by some. Vesely keeps copyright to his images, and that's a smart businessman. When Vesely captured what he probably knew to be "the shot" that illustrated the perfect game, getting those images out became priority number 1. Ron, you see, has his work on the Getty site, as well as having relationships with MLB photos. A cursory review of the Getty Images sporting collection shows that Ron has chops. As prospective clients scrambled for images, surprisingly, the only magazine that had that image was Sports Illustrated, yet SI did not have photographers at that game. Thus, they were going to Getty after-the-fact for a stock image. Since it's nowhere else editorially, it is reasonable to conclude that SI paid a premium for exclusive access to the image for a period of time that would preclude their competition from having the same image. Here's where the interesting part comes in. 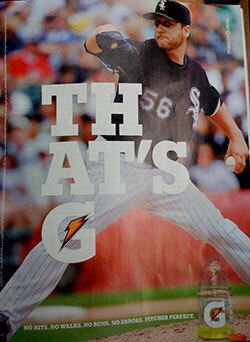 An image from the same game by Ron is is in this Gatorade ad (at left) - IN the same issue. It's also appeared elsewhere. For example, a colleague of mine mentioned that it was also a full page ad in the Chicago Tribune. (see other images from the take here). So, let's see - microstock cover on Time Magazine for $30 (The Real 'New Frugality' - Time Style, 7/25/09), or several thousand dollars for the exclusive on the SI cover as well as a ton of money for the Gatorade ad, which could only have been had via Getty, since Getty is the exclusive licensor of images of MLB for commercial use. Getty wins, Vesely wins, MLB Photos wins, SI wins, and Buehrle - he no doubt won as well. It is imperative that you recognize the value of your images, and not let them go for pennies on the dollar. Vesely likely has several house payments covered thanks to this, whereas $30 wouldn't have covered parking and a hot dog at the stadium that day. Well done Ron, Well done Getty.